A quite serious and enigmatic Ferreri film, before his post-Grande Bouffe period. This film somehow mixes the red tape nightmares depicted by Kafka with the Catholic church's man made organization and hierarchy in today's corporate world, making vis a vis contact with authorities impossible. Apart from the intrigue, this film has Ferreri directing his most dramatic film since "El Cochecito" (Spain, 1960), where his ability to create emotional conflict intermingles with his more satiric and absurdity touch, A facet that's is very interesting to explore, given that his output post-Grade Bouffe is his body of work that most Ferrei enthusiasts are familiar with. 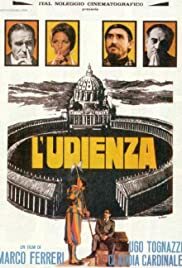 I would argue that this film, along with "Chiedo Asilo" (Italy, 1979) are films that explore Utopian gestures borne of the everyday Utopian man, as it faces the brick wall of bureaucracy and normality and convention. Walking the fine line cinema as "theater of the absurd" of the path explored by Buñuel, Raul Ruiz, Arrabal, Jodorowsky and many others, Ferreri champions (the dadaist-inspired) path less traveled in cinema.